We are pleased to offer our residences the MicroFridge Rental Program for the upcoming school year. The MicroFridge compact refrigerator/freezer/microwave oven combo unit meets all our size, safety and electrical requirements and is approved for use in our	student room’s on-campus. This integrated appliance is considered a necessity by many of our students! In order to insure that there will be a unit available for you, we MUST receive your order by Friday, August 10, 2018. Late submissions of orders may result in a latter delivery of the unit or units may be no longer available. Please limit your calls to normal business hours only. The brand that changed food storage and preparation forever does it again. Loaded with innovative features to make any space more functional and appealing, this environmentally friendly unit delivers the ultimate in versatility... you can even charge your personal electronics with it! Safe Plug® Technology, patent-pending power management system, limits power draw to just 11 amps, requires just one dedicated circuit for the combination appliance. Dual-Outlet Charge Station and Cord Clip lets you safely charge electronic devices such as laptop computers, MP3 players, cell phones and more. 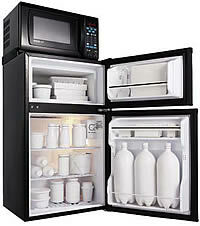 True Zero-degree Freezer provides long-term frozen food storage. Smart Store Door allows upright storage of 2-liter and half-gallon bottles. Unsurpassed 10-year Warranty provides absolute peace of mind. 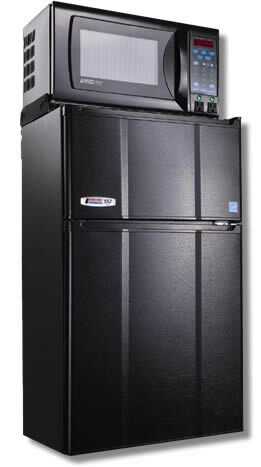 Rented microfridges will be installed in the student's rooms prior to move-in date. Components deliver uncompromising quality and performance. Together, they form one stylish, space-saving unit. Provides protection against circuit overloads for user safety and convenience. Blue plug on refrigerator plugs into back of microwave for energy effi cient one-plug to the wall operation. Annual energy consumption 290 kWh based on standard DOE test. ENERGY STAR rated. Meets CEE Tier 3 specifi cations. Height . . . . . . . . . . . . . . . . 33 1/2"
Width. . . . . . . . . . . . . . . . . 18 5/8"
Width with door open 180º 36 1/4"
Depth. . . . . . . . . . . . . . . . . 20 1/8"
Depth with door open 90º. .37 1/4"
Weight. . . . . . . . . . . . . . . . 58 Ibs. Shipping weight . . . . . . . . . 65 Ibs. Total volume . . . . . . . . . .2.9 cu. ft.
Refrig. compartment vol. 2.13 cu.ft. Freezer compart. vol. . . 0.75 cu. ft.
• Available only in white. Height . . . . . . . . . . . . . . . . . 10 5/8"
Width . . . . . . . . . . . . . . . . . .18 1/8"
Depth. . . . . . . . . . . . . . . . 12 13/16"
Weight . . . . . . . . . . . . . . . . . 26 Ibs. Shipping weight . . . . . . . . . . 29 Ibs. Oven capacity . . . . . . . . . 0.7 cu. ft.